ANOKA, Minnesota – Federal Ammunition is pleased to announce a new 150-grain 300 Blackout load designed for deer hunters in its Fusion MSR lineup. Shipments of this new product are currently being delivered to dealers. Modern sporting rifles are the most adaptable class of firearms in history, handling everything from tactical applications to deer hunting. 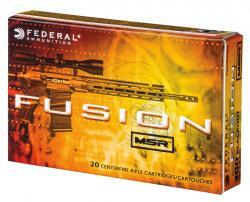 Fusion MSR loads provide that same degree of customization in ammunition. The cartridges are specifically designed for hunting, performing to their ballistic peak through 16-inch barrels for AR15 platforms. The molecularly fused bullet transfers tremendous energy on impact for deadly knockdown power.